Why you or your business should be logging in and joining the E-Learning Community. Training is essential, we all need it at some point in our careers or lives. Whether it be a simple refresher on a subject that you are already familiar with or the daunting task of having to learn a completely new skill, we all need training. For businesses, training is vital to ensure staff, management and above are all trained and competent in their specific tasks. Businesses need to ensure that all machinery and pant are being used safely and correctly, staff are familiar with their job and how to work safely and effectively and training improves levels of competency within the workforce. For individuals, training can improve someones knowledge on a task or subject, make an individual more attractive to an employer or ensure personal safety when working. We all have some sort of requirement for training but sometimes training can be a hassle. Businesses have to dedicate time to staff who require training, they need to arrange for a trainer to conduct the training, they might need to find a location out with the working environment or send staff to a training centre. The cost of all this can very quickly add up. For individuals, training is a personal expense unless there are training funds available, training courses can also be intimidating for people who are unfamiliar with the subject they are training on. Although there is no direct replacement for ‘hands on’ training, there are alternatives. Online Training Courses have become a very popular and successful way to train staff or individuals on a much more affordable level. Businesses can now set up Online Training Accounts and add as many members of staff as they wish. Each member of staff will be given their own personal login details and will be able to work through all of the selected training courses available to them. Employers can monitor their progress and will have on record all of their online training achievements and certificates. Staff members and individuals can work through the courses at their own pace in their own time or dedicated time during their working day. The courses are much more affordable as well with prices starting at as low as £35 per learning account. E-Learning has become increasingly popular throughout many different sectors including the care home, child care, hospitality and health & safety industries. Employers are now encouraging Continual Professional Development for their employees to ensure that all staff members are qualified and trained for their specific working environments. Employees can complete the training courses from home or work and at their own pace. Individuals now have access to thousands of training courses that may have once been inaccessible to them. Browsing through all of the courses available to use ensures that the training course selected is exactly what the learner requires. The online training courses use interactive videos and easy to follow instructions. Learners have the option to watch the videos as many times as they need and are able to review their answers before submitting them. With remote login, this allows users to access their account through multiple devices. Full technical support is available if there are difficulties during the learning courses. 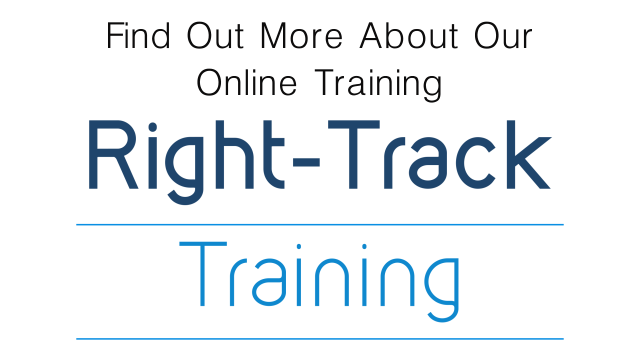 If you are interested in trying out some of the Right Track Training Online Training Courses then why not sign up for a FREE TRIAL first? Check out all of our E-Learning Online Training Courses available and select what you would like to learn. If you are a business and wish to set up a Business Account with us then sign up HERE or contact us for more details and we would be happy to help. Join the E-Learning Community today and expand your knowledge for tomorrow. The old saying – ‘You learn something new every day’ is very true. In today’s world, learning something new has become extremely easy. We can watch online tutorials for almost everything, sign up to open universities, watch online seminars or attend training courses. The more training we do, the further we are able to develop our skill sets and personal portfolios. What we learn can influence us on what we do and how we act. In many cases, learning new skills or developing the skills we already have can become valuable to us personally. If a trainee is now perceived as being more qualified in an area that they have been trained on they will have a new sense of achievement and pride at being able to accomplish a new skill. As well as this, self-assurance at being able to develop existing knowledge already on a particular subject. Often, I see delegates that are more than capable of performing a specific task within the working environment, they just don’t have the self-belief to go and do it. Training allows the learner to establish where they might struggle and work on a task or subject until they are competent enough to take themselves out of the training environment. Sometimes a little bit of extra training can work wonders with a person’s confidence. Many people will find themselves stuck in a rut at work and wish they could move further within their profession. Unfortunately for them, they can’t continue to move their career forward unless they are qualified. As an employer, rewarding staff members with training can be extremely valuable as they will see themselves as being worth the time and money that has been invested into them as a result of their good working performances. As an instructor, I take great satisfaction in watching a trainee learn a new skill that I have taught them. Helping others develop a new skill can give us an enormous sense of purpose as well as keeping us mentally stimulated. At the same time this reassures ourselves on our own knowledge within that area. If someone has been trained to a certain standard then we know that their skill set should be to a level that we can recognise. In the same way that we know if someone hasn’t been trained to a specific standard then they are likely unable to complete a certain task or job (and shouldn’t be expected to either). For most of our training, there is an accredited stamp of approval and certification to show that the person has attended and completed a level of training that reaches a specific standard. This is a great assurance for employers as they will have peace of mind that their staff are qualified to conduct their duties safely and correctly. Although there are very few training courses that are free of charge and the more specialist the training, the more expensive it can be. Training is an investment and will add value to yourself, workforce or business. By ensuring that staff are trained correctly on specific machinery or on Health and Safety in the workplace, this will cut down on costly mistakes as well as accidents at work. Training also improves a person’s skill set and having these new skills can help them further their career and potentially earn more money. To fond out more about our training courses then request a quote for your business and we will be happy to help. First Aid at Work is a must for every employer as well as a skill that can be very useful for individuals who wish to learn life saving skills. With the demand for First Aid courses in Edinburgh so high, Right Track Training are now offering Emergency First Aid at Work evening classes for groups of people interested in gaining fully certificated and accredited First Aid training. The Emergency First Aid at Work evening classes are run over 2 evenings between the hours of 6pm and 9pm. The courses are available to anyone who is interested in gaining an Emergency First Aid at work certificate. Prices for these courses are as low as £35 per person! A relaxed atmosphere for candidates to learn and practice the important First Aid skills that are vital in any emergency situation. Emergency First Aid at Work is the most basic accredited and recognised first aid requirement for employers. Although the 3 day First Aid at Work certificate is recommended, the Emergency First Aid at Work qualification is perfect for people in low risk working environments. Many employers may struggle to lose members of staff for a full day for training courses, this is why the new Emergency First Aid at Work evening courses have been so successful in Edinburgh. If you would like to enquire about when our next Emergency First Aid at Work Edinburgh Evening Courses are then give us a call – 0330 022 0680 – email us – info@right-tracktraining.co.uk or complete one of our online booking forms. This course is perfect for anyone who would like to gain an accredited certificate in Emergency First Aid at Work, employers who would like more staff training, students and anyone who would like to learn more about the basic and simple First Aid skills that we teach. What is The Importance of Defibrillators? Every year there are around 60,000 out of hospital cardiac arrests in the UK. Unfortunately, just under half of the people who suffer a cardiac arrest will die. What does ‘Cardiac Arrest’ actually mean? According to the British Heart Foundation, “A cardiac arrest happens when your heart stops pumping blood around your body.”. When this happens, we only have a very short time to react. The reaction that you give could be the difference between someone living or dying. During a cardiac arrest the casualty will only have around 4-5 minutes of oxygen circulating around their body. During this short time, the casualties body will slowly start to shut itself down, as blood flowing into the brain and other vital organs will be reduced and then stopped. This is why what we do within this 4-5 minute time period is vital. For every minute without CPR or defibrillation, the casualties survival rate will reduce by 7-10%. The importance of CPR is to keep the casualties blood pumping to the vital organs which will keep them alive until the emergency services arrive. The survival rates for CPR alone are just 6%, however, if a defibrillator is used within the first 3 minutes of cardiac arrest the casualties chances of survival will rise to 60-70%. With these statistics, it is no wonder that more and more defibrillators are being brought into public areas as well as working environments. Golf clubs, community centres, schools, sports centres, train stations and shopping centres are all places that are now providing public AEDs (automated external defibrillator). Many rural communities are also providing public access to defibrillators which are located in easily accessible locations within small towns and villages. Although training is advised and available on how to use an AED, they are very straight forward and user friendly. Many of the different makes and models will provide a simple picture guide as instructions and all of them will give direct instructions through audio speakers built into the machine. Not only should these devises be readily accessed by anyone who is in need but they should also be easy to use. Watch this short video to see exactly how easy it is to use a defibrillator. Training can be provided on how to use a defibrillator for any businesses or centres that have recently purchased an AED for their premises. Although they can be easy to use and very user friendly it is always advised that anyone who is working in an area that could use a defibrillator should be trained on how to use one. These basic skills can make the difference between a casualty living or dying. Sign up to one of our AED half day training courses now or contact us for any more information. Would you save a life or stand back and watch someone die? This seems like a pretty silly question but unfortunately, recent studies have shown that up to 60% of accident related deaths in the UK could have been prevented if basic first aid had been given. The study carried out by The British Red Cross and The University of Manchester also found that while 93% of people would phone 999, just half would choose not to carry out any form of first aid whilst waiting for the emergency services to arrive. It has been proved that in the crucial time between an accident happening and the emergency services arriving, the most basic first aid could make the difference between a casualty living or dying. What can YOU do to save a life? In a case of accidental injury or trauma, The British Red Cross have identified that placing a casualty that is unconscious/unresponsive on their side and tilting their head to open the airway or applying direct pressure to a moderate to major bleeding wound for casualties with traumas could be enough to save their life. These very basic but simple first aid treatments could be enough for anyone to save a casualties life. By simply placing someone in the recovery position or applying pressure to a wound until the emergency services arrive, you could have done enough to keep someone alive until professional treatment can be given. Anyone can learn these simple skills by attending a simple and basic first aid course.